Korean maker and partner Kia will launch 26 “eco” models by 2020. The Hyundai Ioniq will be offered with hybrid, plug-in and EV versions. Hyundai has big plans for the “eco” market, with the maker planning to introduce 26 new hybrid, plug-in, battery-electric and fuel-cell vehicles between now and 2020, a blitz that begins with this year’s launch of the new Ioniq model. The challenge, said the head of the Korean carmaker’s green car program, will be winning over motorists who’ve so far shown a reluctance to buy battery and hydrogen cars in large numbers. But, facing increasingly stringent emissions and mileage mandates, Hyundai – and its rivals – have no choice but to bring cleaner, more energy-efficient products to market, said executive Byung Ki Ahn. Initially slow to embrace alternative power, the company has been ramping up its efforts over the last several years, adding a variety of new vehicles, such as hybrid and plug-in versions of the Hyundai Sonata, a pure battery-electric Kia Soul, and a hydrogen fuel-cell-powered version of the Hyundai Tucson. The new Kia Niro made its debut in Chicago. 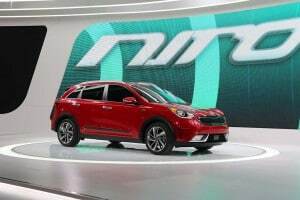 Earlier this year, the Korean manufacturer launched its next wave of green cars with the debut of both the Kia Niro and the Hyundai Ioniq. Both models share the same underlying platform, developed specifically for use with alternative powertrains. The Niro will be offered with a choice of conventional hybrid or plug-in drivelines. The Ioniq will also be available with a pure battery-electric drive system. It is currently debuting in Korea and will reach U.S. showrooms at the very end of this year. With the launch of Niro and Ioniq, Hyundai hopes to make a dent in demand for the long-popular Toyota Prius. The Korean maker lifted a page from the Japanese competitor’s playbook by developing unique bodies for those two green cars. 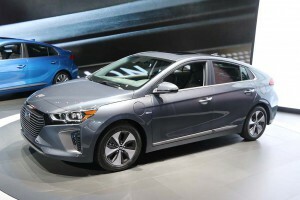 And while final EPA ratings haven’t been released, Ahn said he expects the hybrid version of the Hyundai Ioniq will deliver better mileage than Prius. With the launch of Niro and Ioniq, Hyundai and Kia will collectively offer 10 eco models, but by 2020, that will grow to 26, according to Ahn. “Not all” will come to the U.S., he cautioned, but the majority likely will. The list will include 10 conventional hybrids, eight plug-in hybrids, or PHEVs, six pure battery-electric vehicles, or BEVs, and two hydrogen fuel-cell vehicles, or FCVs. The next hydrogen car is set to debut in 2018, he revealed. 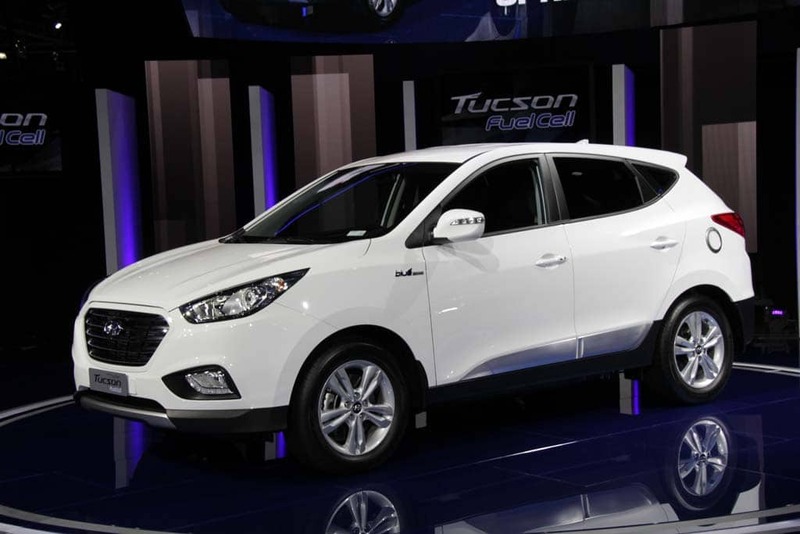 At the same time, Hyundai will drop the current Tucson Fuel-Cell Vehicle. Though Ahn would not confirm specifics, it is expected that Hyundai and Kia will each get an FCV by 2020. The fuel-cell version of the Hyundai Tucson. The timing of the new hydrogen car’s launch not coincidentally matches the timing of the 2018 Winter Olympics which will be held in South Korea. And it helps the country steal a bit of thunder from Japan which hosts the 2020 Summer Olympics. Japanese plans call for the country to make a big show of hydrogen technology as part of its Olympic efforts. Sales of hydrogen cars have been modest, at best. According to Ahn, the company has so produced just over 700 FCVs so far. Part of the problem is a lack of a refueling infrastructure, though the executive said Hyundai is participating in efforts to set up new hydrogen pumps in both the U.S. and Korea. Sales of battery-based vehicles have also been slow to build momentum, but Ahn said the auto industry has no choice but to produce new green vehicles if it’s to comply with increasingly stringent global standards such as the 54.5 mpg mandate going into effect in the U.S. in 2025. The challenge is finding ways to make alternative power more appealing, he said, during a luncheon meeting in Detroit. That will require driving down the cost of batteries, even as range is increased. Over the next 18 months, both Tesla and General Motors will launch sales of longer-range models targeted at the mainstream, and Ford and Nissan are planning similar models. “We have plans to introduce a 200-mile EV,” as well, Ahn revealed, adding that, “Timing is in the 2018 range.” Getting up to 200 miles a charge, he said is “necessary” to attract more mainstream buyers. Meanwhile, he hinted it is “reasonable” to expect Hyundai’s longer-range battery-car will carry a price of somewhere between $30,000 and $35,000. Sales of alternative vehicles have also been hurt by low oil prices over the last 18 months, but Ahn said he doesn’t expect motorists to get a bargain much longer. Gas prices have already been rising in recent weeks and as the upward swing continues, battery and hydrogen vehicles should start looking more and more attractive, he said. This entry was posted on Wednesday, May 25th, 2016 at and is filed under Automobiles. You can follow any responses to this entry through the RSS 2.0 feed. Both comments and pings are currently closed.